Welcome to Day 28 of my #100DaysofBulletJournalIdeas Project! 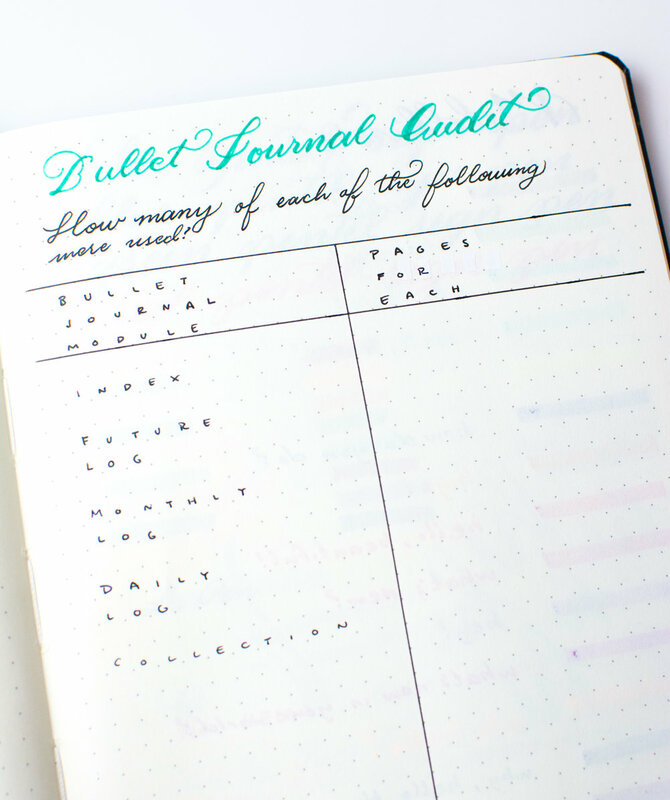 By conducting a simple Bullet Journal Audit to see how many of each type of module you have, you'll be able to see which parts of the Bullet Journal you use the most. This can be helpful to see if you're using certain parts more than others and how you can improve your use. You can also add Weekly Log, and other sections such as 'Worked,' 'Didn't Work,' and possibly even 'Blank Pages' to see how you're using your Bullet Journal. This can help you refine your system and see whether you have unused pages or to figure out the lifespan of your Bullet Journal. If you tend to finish your Bullet Journal quickly, this might help shed some light. It can also just be a neat exercise to do if you're ever curious about how much of each Bullet Journal module you use in each Bullet Journal. It can also be fun to compare between different Bullet Journals to see how many Daily Logs versus Collections were used.